Swami Vivekananda’s pre-monastic name was Narendranath Dutta.This was perhaps the first time that, with the help of a strong power of imagination, Naren entered the region of deep meditation and was completely merged in it. In those days there was no school in Raipur. This gave Naren the time and opportunity to become very intimate with his father-a great privilege, for his father had a noble mind. Vishwanath attracted the intellect of his son. He would hold long conversations with him upon topics that demanded depth, precision and soundness of thought. He gave the boy free intel-lectual rein, believing that education consists in stimulating, and not in superimposing ideas. To his father Naren owed his capacity for grasping the essentials of things, of seeing truth from the widest and the most synthetic standpoint, and of discovering and holding to the real issue under discussion. Many noted scholars used to visit Vishwanath at Raipur. The boy would listen to their discussions, and occasionally join them, introducing his personal views. Sometimes the elders, astonished at his cleverness, would treat him on an equal footing -a sight which gladdened his father's heart. With one friend of his father, a great authority on Bengali literature, Naren joined in conversation and took the man by storm; quoting verse after verse and paragraph after paragraph from standard works. So impressed was the man that he said, "My lad, we shall hear of you some day." And the prediction has come true, for Narendranath, as Swami Vivekananda, became a significant writer in the Bengali language. His English writ¬ings have been praised as well, both in the East and in the West. Even in his youth, Naren sought, nay demanded, intellec¬tual equality with and recognition from everyone. So ambitious was he in this respect that if his mental powers were not given recognition, he would fly into a rage, not sparing even his father's friends; and nothing short of an apology would quiet him. Nachiketa of Katha Upanishad fame had also this sense of self respect, refusing to be belittled. "Among many I am the first;" he said, "and among many others I am the middlemost. (But certainly I am never the last.)" Of course, Vishwanath could not tolerate such outbursts of Naren, especially against elderly persons, even though they proceeded from a sense of self respect. So Naren was each time severely reprimanded; hut in his heart the father was glad that his son was so spirited. In 1877, when Naren (Swami Vivekananda) was fourteen years old and a student of the third class (equivalent to the present class eight), his father went to Raipur in the Central Provinces. Knowing that he would have to live there for quite a long time, his father, Vishwanath, had his family brought there shortly afterwards. The place was not then connected by railway; so one had to travel by bullock-cart for more than a fortnight through dense forests full of beasts of prey. Naren was charged with taking the family there. Although he had to suffer many hardships, he did not feel them at all on account of the wonderful beauty of these forest regions of central India. His heart was charmed with the boundless power and endless love of Him who had adorned the earth with such incomparable robes and ornaments. Indeed, during this period Naren had acquired a keen sense of personal dignity, and when he returned to Calcutta from Raipur, he was a changed boy. Even his physical appearance was becoming manly. He had always been physically perfect, but he was now acquiring that regal bearing which made him, in after years, a notable figure wherever he went. Further, he was beginning to discriminate in the choice of his friends, accepting only his intellectual peers. But however his tempera¬ment might conflict with circumstances and with people, he was consistently large-hearted and generous, for such was his nature and heritage, and he was always loved. In Raipur Naren learned the old Indian game of chess, and often came out victorious in many hard contests. 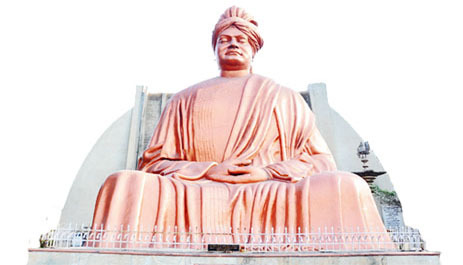 Again, it was at Raipur that he was taught the secrets and mysteries of the culinary art by his father; for Swami Vivekananda was, like his father, an excellent cook. We have already mentioned that Vishwanath was a lover of music and used to sing himself. He also created in his house an atmosphere suitable for the cultivation of music. As men¬tioned in a foregoing chapter, he had noticed Naren's love of music and his musical potentialities from early in the boy's life and had nurtured them carefully. He was of the opinion that unless one received proper training in a traditional manner under masters of music, one could not really earn competency in the art. He himself had given Naren his first training in music, and now while at Raipur, where he had more intimate contact with his son; he taught him many songs of various kinds. Revered Swami Atmananda (1929-1989) was the founder Secretary of this Ashrama. It was because of his untiring effortes that Ramakrishna-Vivekananda Movement had widespread recognition in Chhattisgarh-Madhya Pradesh. Inspired by the ideas and ideals as lived and preached by Sri Ramakrishna and Swami Vivekananda, a small band of young men at Raipur, started gathering together, once a week, at the residence of Sri A Biswas, located at Daga Buildings, Byron Bazar. They would sing the 'Aratrikam' composed by Swami Vivekananda and read out from the Gospel of Sri Ramakrishna and the Complete works of Swami Vivekananda. This eventually led into forming a society to organize the activities of this small but devoted band which later on got registered in the name of Shri Ramakrishna Sewa Samiti. When Swami Atmananda visited Raipur in 1960, he became the nucleus to bind the activities of the Samiti, which then shifted to a small rented house in Budhapara, a locality sanctified by Swami Vivekananda's stay for two years (1877-79) during his adolescence. It was then vigorously planned to establish a Centre on a permanent footing to commemorate Swami Vivekananda's stay here and to complete the first phase of the Ashrama by the time the world celebrated his birth centenary in January, 1963. Accordingly this Ashrama was founded on its own present land in April, 1962 and the Samiti got affiliated to the Ramakrishna Mission with its headquarters at Belur Math on 7th April, 1968. And hence, the then Shri Ramakrishna Sewa Samiti was renamed as RAMAKRISHNA MISSION VIVEKANANDA ASHRAMA. The story of the Ashrama, since its inception, has been a story of its dedicated medical and educational services apart from the spiritual and cultural, rendered to the general public. 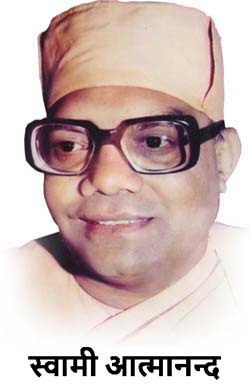 Revered Swami Atmananda (1929-1989) was the founder Secretary of this Ashrama. It was because of his untiring efforts that Ramakrishna-Vivekananda Movement had widespread recognition in Chhattisgarh-Madhya Pradesh.